Are you looking for an intimate, small Daytona Beach Wedding ceremony? All of our beach wedding packages can be tweaked to fit your guest limit. If you are truly wanting a small Daytona Beach wedding, then one of our variations of the Florida Simply Package would be ideal. If you are looking for more colors and more traditional wedding choices, such as having a bridal party, an aisle-way, and more guests, our Nautical Knot is also an ideal choice. Our Florida Simply Package is our budget friendly Daytona Beach wedding package. This package is only good for the bride and groom and up to six guests. It includes the bamboo canopy draped in your choice of white or ivory with the option to have a strand of starfish across the top of the bamboo canopy. 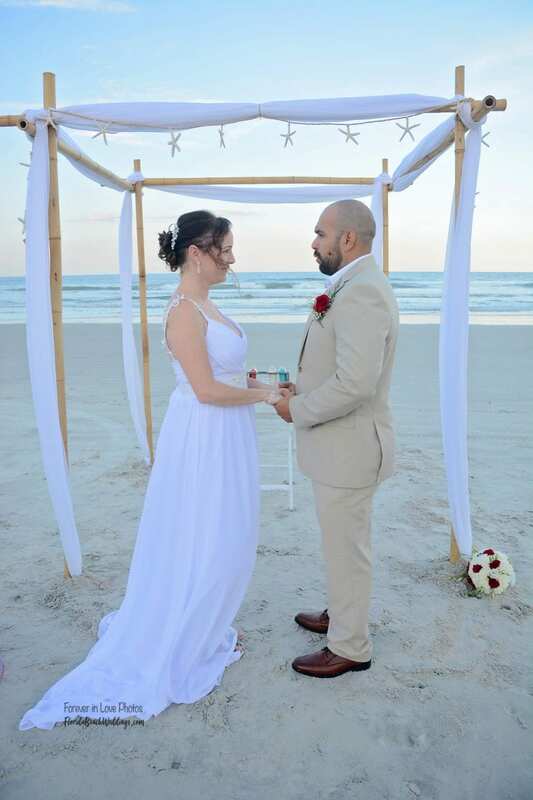 We also include a unity sand ceremony, officiant and a ceremony photographer to complete everything you need for your beach wedding ceremony in Daytona to be a success. We believe in making your small Daytona Beach wedding just as eventful as any other wedding. We have the option to add additional photos for an additional charge. This keeps the photographer at the beach for up to 45 minutes (including the ceremony) to take posed photos of you down by the water. You will receive all the photos via digital download link, or you will have the option to have a CD of the photos mailed to you for an additional charge. We love this option for small Daytona Beach Weddings, so you make sure you have the best photos to bring home with you and show off to your friends. Adding a first dance is another way to make sure that your small Daytona beach wedding is unforgettable. You and your significant other will share a dance to the song of your choice in the most beautiful setting under your bamboo canopy. With all the perks of the Florida Simply Package but beautiful decor that will leave you breathless, our Natural Simply Florida beach wedding package is a favorite among our brides. With upgraded natural bamboo canopy, your choice of white or ivory material elegantly draped across the canopy and a natural branch and floral canopy topper, your Pinterest dreams will be a reality. For just $75.00 more you will get this beautiful upgraded decor for your small Daytona Beach Wedding ceremony. You can still add the additions such as extended ceremony photography and the first dance under the bamboo canopy. 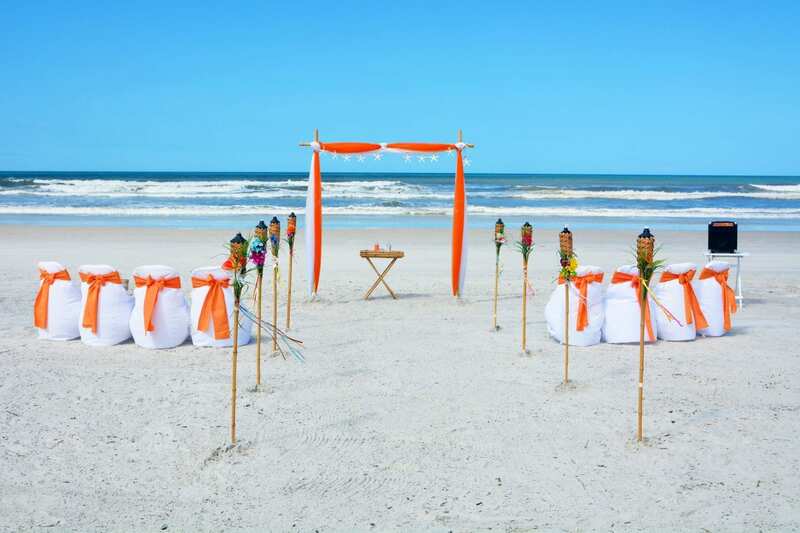 You’re having a beach wedding in Daytona- why not show off all the tropical beauty the beach has to offer and choose our Tropical Simply Florida beach wedding package. With upgraded, large bamboo, your choice of white or ivory elegantly draped material, palm frond and tropical floral arrangement topper and the added conch shell accents at the base of the canopy, you will feel like you’ve left reality and entered paradise for your small Daytona Beach Wedding. With this package, you are allowed up to six guests, including kids. Our Simply Deluxe Beach Wedding Package has it all! 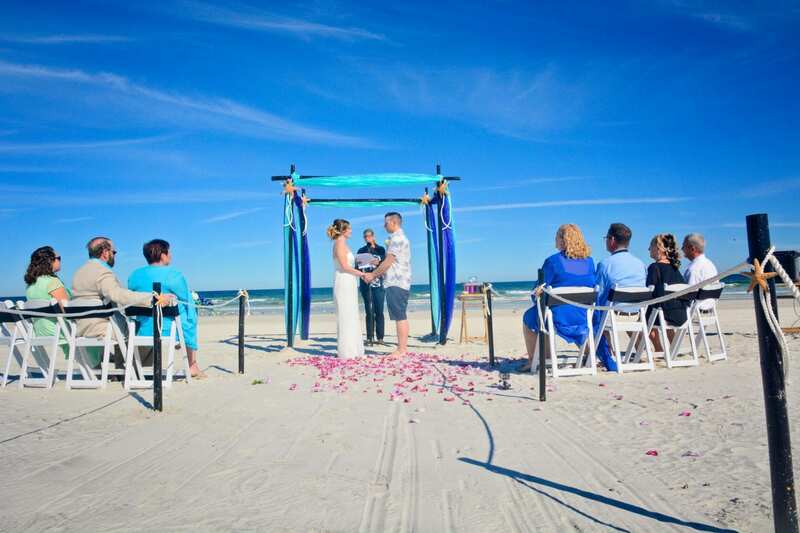 What makes the Simply Deluxe Beach Wedding package the ideal choice for your small Daytona Beach Wedding Ceremony? 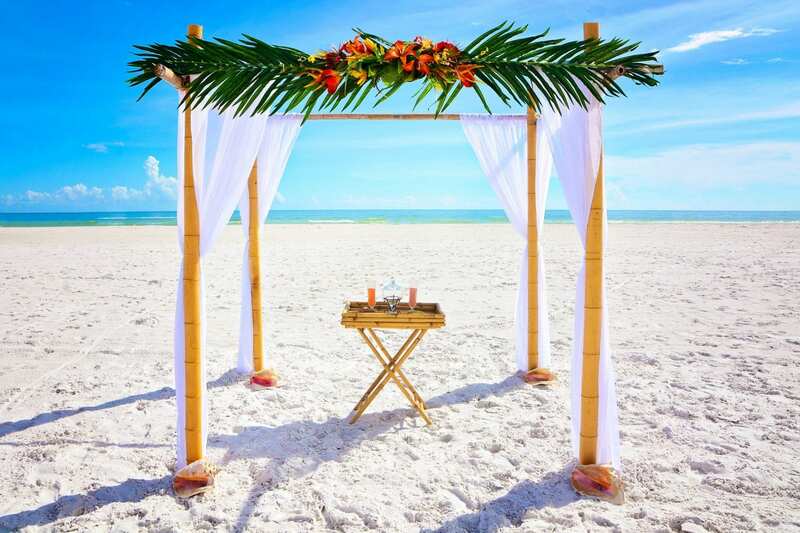 This beach wedding package is great because you get the beautiful four post canopy of the Simply Package, but you also receive up to 6 chairs for your guests and your choice of traditional or steel drum music for the bride to walk down the aisle. 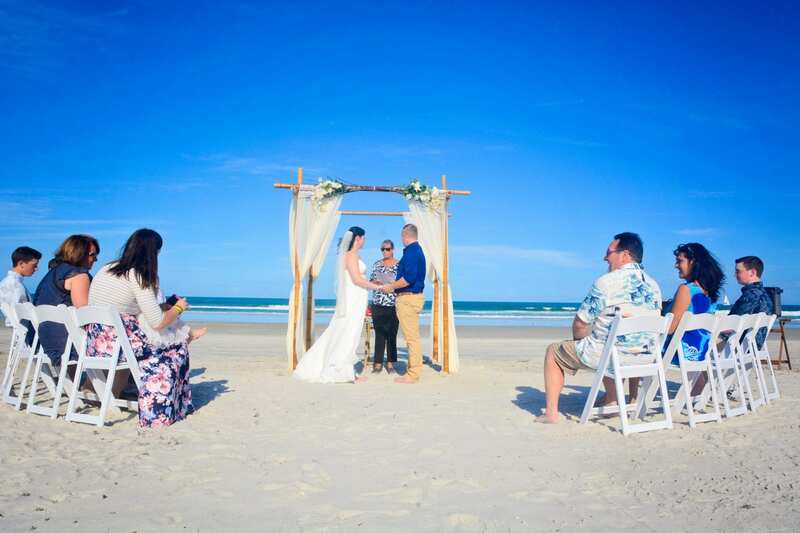 This beach wedding package has a guest limit of 6 as it is meant for small Daytona Beach Weddings, and as with all of our Simply beach wedding packages we do not allow any bridal party. 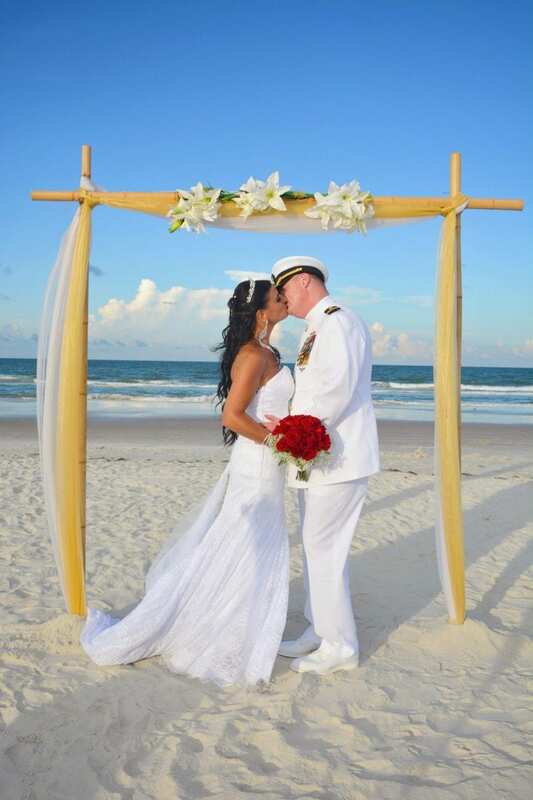 If you are having more than six guests, or are looking for more decor and the option for a bridal party, our Nautical Knot Daytona Beach wedding package is for you. 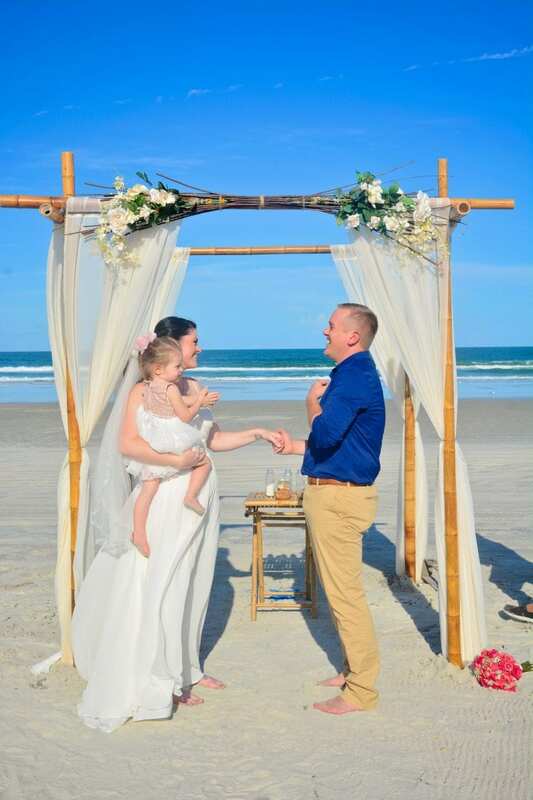 This Daytona Beach wedding package includes a 3 post bamboo canopy (two straight up and one going across) draped in your choice of two colors, your choice of starfish or floral topper from our selections, up to 14 chairs covered and sash in your color choice from our selections, traditional or steel drum music, officiant, ceremony photographer, and your choice of aisle-way from our selections. With our Nautical Knot beach wedding package, you can also have a bridal party. Keep the feel of a traditional wedding ceremony while escaping the expense and drama that goes with it. All of our Daytona Beach wedding packages can be perfect for a small Daytona Beach wedding. 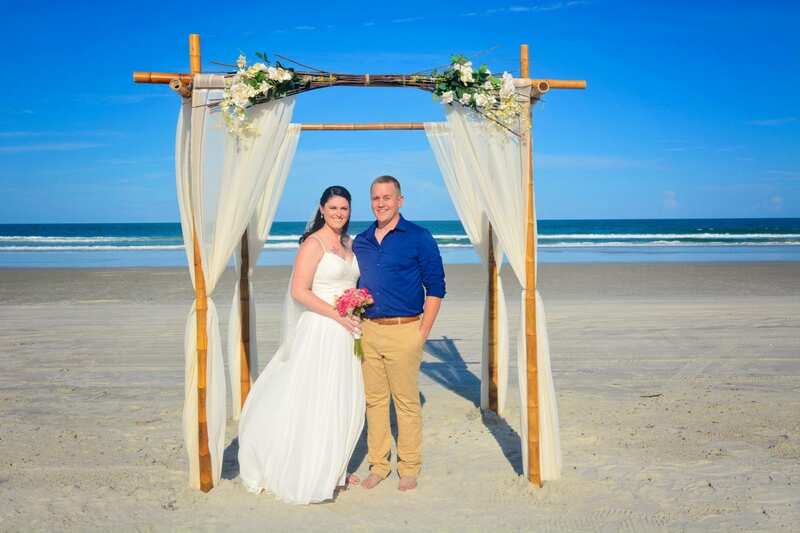 Melissa and Chase (shown to the right) chose our Anchors Away Distinctive Design Daytona Beach wedding package for them and their 8 guests, and it couldn’t have been more perfect. Whether you are looking for intimate or luxurious, we have a Daytona Beach Wedding Package for you.